The new Keurig 2.0 brewer models offer an upgraded brewing system and several new features not available in the original K-Cup Brewing System machines. Perhaps the most noticeable benefit of the new machines is that in addition to brewing single cups of hot fresh coffee, you can also brew a small carafe. The 2.0 machines have large water reservoirs, are fully programmable (including coffee strength), and offer several cup sizes. Currently these machines only work with K-Cups with special encoding that were made after July 2014 (as well as special Vue packs and K-Carafe packs). If asked, Keurig will offer a coupon to replace older K-Cups you may have on hand. Users love how easy these machines are to use, the number of brewing options and the ability to make rich bold coffee. As with all Keurigs, the 2.0 personal brewers need to be cleaned regularly to keep them performing at their best. These machines are UL listed for Household Use Only. Keurig 2.0 brewers use the new Keurig 2.0 Brewing Technology, which reads the lid of the inserted K-Cup to optimize the brew and produce the best possible flavor. That along with being able to choose coffee strength, brew a small carafe and choose multiple brew sizes is considered a big step up from the original K-Cup Brewing System line. The 2.0s come in three models: K350, K450 and K550. The K360, K460 and K560 are the same as their 3, 4 or 5 series counterparts but may be packaged with a different assortment of K-Cup samples. The K300, K400 and K500 are identical to their counterparts but do not come with the optional water filter. Models beginning with a B instead of a K (B350/B360/B300, B450/B460/B400, B550/B560/B500) are identical to the K version with the same number. When you compare the 2.0 models you quickly realize they are all very similar, although features differ slightly. 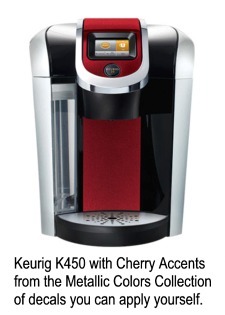 These new Keurig coffee makers operate just like the original Keurigs do – pop in a K-Cup and brew. But, the 2.0 Brewing Technology allows you to program the strength of the coffee (greatly appreciated by those who prefer strong bold coffee) and to choose between 10 brew sizes, from 4 – 30 ounces. They all brew a single cup in under a minute. The included 32-ounce carafe, along with any of the limited number of K-Carafe packs, can be used to brew up to 4 cups at a time. Choose 2-3 cups (22 ounces), 3-4 cups (26 ounces), or 4-5 cups (30 ounces). The carafes take a little longer to brew, usually around three minutes. One difference between the new machines and the originals, and this may be a biggie for some people, is that the new Keurigs will not brew without specially coded K-Cups. The advantage is that the machines read the code and alter the brewing process to produce the best possible cup of coffee from each of over 250 flavors of K-Cups. The drawback is that My K-Cup and third party reusable filters for ground coffee, as well as older and generic K-Cups, do not work with these machines. 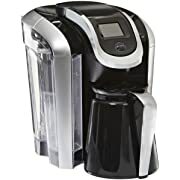 If you’re looking for a Keurig that accepts a reusable filter for ground coffee visit this page for Keurig comparisons. All K-Cups now come with the encoded lids (look for the Keurig logo) so they’ll work with the 2.0 brewers, but many retailers will wait to order them after selling out of their older stock (made before August 2014). So, be sure you can find your favorite K-Cup flavors in the new K-Cups before purchasing one of these machines. Bed Bath and Beyond is one place to find them. Third-party vendors are now producing work-arounds for the 2.0. The Freedom Ring (free) allows any K-Cup to work with the 2.0. Also, new reusable filters by Perfect Pod that allow brewing with ground coffee are getting good reviews, the Eco-Fill and the Eco-Fill with paper filters (follow the instructions carefully). We have not tested any of these so we can’t confirm how well they work but the reviews are good. While there is the ability to make hot chocolate fluffy, do not confuse this with frothing for lattes and such. This is not the machine you want for those types of drinks. These machines also can be programmed for Auto On/Off, accept water filters to clean up off-flavored water, have descale alerts, low water alerts and can produce hot water for other uses. The drip trays are removable so there’s room for travel mugs up to 7” tall. The large water reservoirs can be removed and filled at the sink, although they can also be easily filled while in place on the machines. The energy saving Auto Off feature allows you to set the machine to power off in a specified number of minutes after the last brew. The Auto On feature allows you to specify when the machine turns on. Carafes can be set to brew at a particular time but not single cups. The clock disappears once the machine is in sleep mode, but can be awakened by tapping the touch screen twice. All clock and brew settings will be lost if the machine is unplugged. The 2.0 brewers are black and silver. Decal sets are available to customize the look of the machines by adding colored stripes, and texture. (the red decal set is especially attractive!). Currently, the decal sets are only available from Keurig.com. The K550 allows you to change the wallpaper on the touch screen and choose night light colors to match (which illuminate the water reservoir): red, green, blue or white. Because of the different pump, these machines are a little louder than older discontinued machines with Quiet Brew technology. Removable parts, including the carafe, are not dishwasher safe. It’s recommended that you wash them by hand and dry with a soft cloth. All plastic parts are BPA free. Important: Before brewing your first cup or carafe, follow the instructions in the user manual to run a cleansing brew to prepare the machine for brewing. Weight 13.6 lbs. 13.7 lbs. 13.9 lbs. These machines offer 10 brew sizes, including the 22, 26 and 30-ounce brews that require the carafe. Cup sizes when brewing from K-Cups are 4, 6, 8 and 10 ounces. Vue packs allow you to brew larger cups of 12, 14 and 16 ounces. K-Carafe packs produce 22, 26 and 30 ounce carafes. For 4, 6, 8 and 10 ounce cups, use K-Cups made after July 2014 with the special encoding in the lids, which some retailers may not yet stock (look for the Keurig logo on the lid). 250+ flavors of coffee and other beverages are available. Larger cup sizes – 12, 14 and 16 ounce – require Vue packs, which are gradually being converted over to work in the 2.0 brewers (Vue packs fit the now discontinued Vue brewers). Look for a large dot in the 9 o-clock position on the lid. K-Carafe packs are required for brewing small carafes of coffee. Currently, 10 flavors are available. Vue packs and K-Carafe packs can be recycled after certain parts are removed. K-Cups are available in a huge variety of roasts and flavors, and from many popular coffee brands. Vue packs and Carafe packs have a much smaller selections to choose from. If no K-Cup or K-Carafe is in place, the machines will produce hot water for use in making hot chocolate, tea, other hot beverages, oatmeal, soup mixes, etc. The K550 has a button that dispenses hot water while held down, while the other models produce hot water when brewing without a coffee pod in place. K-Cups are available for making Hot Chocolate, Chai Tea, Iced Tea, Lemonade, Iced Coffee drinks, espresso, cappuccino, hot apple cider and a number of other hot and cold beverages. It’s important to run a cleansing brew after brewing hot cocoa so that the needles don’t clog up (instructions vary by model – see the manual included with the machine). No coffee or water filters are required for this machine, but the optional Water Filter Kit with charcoal filters is included with the K350/K360, K450/K460 and K550/K560 machines. The water filter will improve the flavor of off-tasting water, producing better tasting coffee. Keurig recommends bottled or filtered water for all of its machines, especially if your water has an “off” taste to it from chlorine or other substances. The optional Water Filter Kit included with the K350, K450 and K550 can improve the taste of the water but will not remove minerals that can collect on the inside of the machine. The manufacturer recommends not using softened water, overly hard water, distilled or reverse osmosis water. Keep in mind that mineral deposits, which can affect brewing performance, are likely to build up in the machine, regardless of what water you use. Descaling removes these deposits and helps conserve internal parts such as heating elements. Hard water that’s high in minerals, like calcium, causes the fastest build-up, and means machines should be descaled more frequently than the recommended 3-6 months. The Keurig 2.0 models track the amount of liquid going through the brewer and issue a “Time to descale” prompt, although you may need to descale more often if you’re using hard water. It takes about a minute to brew a cup of coffee and up to 3 minutes to brew a carafe. Most users feel that the convenience of K-Cups, Vue packs and K-Carafe packs makes them worth the extra cost over ground coffee. The cost can be reduced by purchasing in larger quantities (24+ per package) and by creating a monthly auto-ship subscription. All programming options are handled via the easy-to-use touch screen (black and white for the K350, colored for the K450, and a larger colored screen for the K550). The Power Button icon is located in the bottom right corner of the touch screen. It will appear once the brewer has been plugged in. To brew a single cup of coffee, place a mug in the drip tray (which can be removed to accommodate taller mugs). Lift the lid by the handle and place the selected K-Cup or Vue pack in the holder. Close the lid by lowering the handle. Select the brew size and “Strong”, if desired (or Hot Cocoa/Other if the instructions on the K-Cup say to do so). Press the “Brew” button. To brew a carafe, remove the drip tray and position the carafe under the nozzle. Select a K-Carafe pack and insert it into the holder and close the lid. Make sure that the number in the circle on the lid is at 9 o’clock when inserting. Select a brew size and press “Brew”. If you remove the carafe before the brewer is finished, the brewing process will stop, and start again from the beginning of the brewing process (not where it left off) when the carafe is put back in place. The brewing process is optimized for the K-Cup, Vue pack or K-Carafe pack you’ve selected. For some flavors and settings the coffee may exit in a pulsing rather than steady stream. Wipe the machine down with a damp, soapy non-abrasive cloth. Don’t immerse the machine in water. Remove and empty the drip tray, but be careful, quite a bit of liquid can accumulate there. Clean the water reservoir and lid once a week. Remove the reservoir and the water filter, if installed, and empty and wipe down the reservoir and lid with a damp non-abrasive cloth. Don’t dry with a cloth as it may leave lint behind. Do not put any 2.0 brewer parts in the dishwasher, including the carafe. Clean the carafe after every use by removing the lid and emptying it. Wipe it out with a soft, lint-free cloth, then rinse it thoroughly. Do not put the carafe in the dishwasher. Replace the lid, ensuring that it’s securely in place prior to brewing your next carafe of coffee. Store the brewer upright in a frost-free place (you won’t be able to empty the internal water reservoir so the machine should not be allowed to freeze). Empty the water reservoir before storing. When ready to re-start the brewer, follow the instructions on page 8 in the user manual – the same instructions you’ll follow when preparing the machine for its first brew cycle. Also brews a small carafe of up to 4 servings. 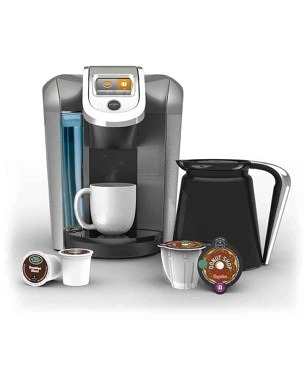 Brewing process is optimized for each K-Cup, Vue pack and K-Carafe. Choice of 10 brew sizes. Large water reservoir that can be filled at the sink. Program brewing start time for carafes. Energy Saving – Program Auto On/Off. Removable drip tray for tall mugs. Easy to read touchscreen with clock. Choose English, Spanish or French language touchscreen. This machine has a one-year warranty against defects under normal home use in the U.S. and Canada. The manufacturer can be reached by phone 7 days a week and any time by email. 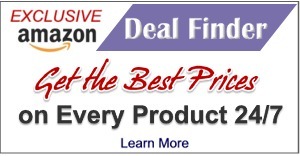 Refunds and replacements are handled by the seller. Replacement drip trays and other parts are available, but call the manufacturer’s help line first, as they may offer another solution. Keep in mind that the warranty will be voided if you open up the machine to try to diagnose a problem or fix it yourself. K350: 13.45” H x 10.43” W x 13.63” D, Weighs 13.6 lbs. K450: 16” H x 12.7” W x 18.3” D, Weighs 13.7 lbs. Cord: 3 feet long with a three-pronged plug. Can be hidden inside the machine. Cup size: Machines measure 5.5” from the drip tray to the dispenser nozzle, and 7” without the drip tray. UL Listed for Household Use Only. Not appropriate for office buildings and other commercial environments. A solid single cup coffee maker that’s easy to operate. K-Cups make it largely mess-free and easy to keep clean. Each cup of coffee can be a different flavor – just use a different K-Cup. Can be used to make coffee and tea in a variety of flavors, as well as other hot and iced beverages, like hot cocoa and iced tea. The brew cycle is customized for each K-Cup to optimize the flavor. Can brew rich extra bold coffee. Choose between 8-10 brew sizes. Use compatible Vue packs to produce fully-flavored larger cups of coffee. 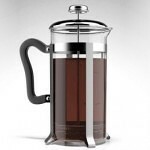 Can brew a carafe of up to 4 cups with K-Carafe packs. Carafes can be programmed to auto-brew at a specified time. There’s no need to use special water, although filtered or bottled water is recommended, and hard, softened, distilled and reverse osmosis water is discouraged. No filters to deal with, although the included Water Filter Kit (K350, K450, K550) cleans up off-tasting water. Program it to turn On and Off at specified times to save on electricity. Does not accept My K-Cup reusable coffee filters, or third party equivalents, for brewing ground coffee. Will not brew with K-Cups made prior to July, 2014 (but Keurig will provide a coupon to replace those you have on hand, if asked). Some Vue Packs (for larger cup sizes) have not yet been converted to work with the 2.0 machines. K-Carafe packs come in just 10 flavors. Does not accommodate the height of some travel mugs. While you can program the machine to turn on and warm up at a certain time, you cannot program it to brew single cups at a specific time (you can set it to brew a carafe at a specified time). Needs regular cleaning of exterior and internal parts to perform well. 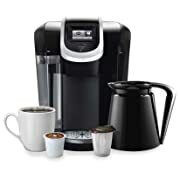 Must run a cleansing brew (without K-Cup) after brewing hot cocoa and other milk based drinks. Removable parts are not dishwasher safe. UL listed for Household use only – not intended for use at the office or in other commercial environments (a plus if you’re looking for a machine for home use). Many users are unhappy that they cannot use older K-Cups they already own with these machines (Keurig will offer a replacement coupon, if asked). Many more dislike not being able to save money by brewing ground coffee in a reusable filter. Users who don’t care about brewing ground coffee in their Keurigs seem to love their 2.0 machines. They cite better coffee (and stronger brew options for those who love their coffee bold), ease of use, and that they appreciate having the option to brew a carafe. It’s too early to tell what issues the machines may develop over time. Common issues in older model Keurigs – like partial cups and leaking – are often maintenance-related (clogged needles, scale buildup). We assume that will be the case with the 2.0 brewers, as well. Complaints of coffee that’s not warm enough (with older models) usually have to do with starting out with cold water, brewing into a cold mug, or adding an excess of cold milk or cream to the finished cup. Avoid these by filling the reservoir with room temperature water, pre-warm the cup with hot water, and add the cream to the bottom of the cup before brewing into it. Keurig Support assures us that all of their machines have been thoroughly tested and proven to be food-safe. All parts that come into contact with water, including K-Cups are BPA free and FDA approved for the temperatures they encounter. However, California Proposition 65 requires that manufacturers provide a warning if any of over 800 listed harmful chemicals are present in products sold in California. Run a cup of white vinegar through the machine (without installing a K-Cup) and follow it with several water-only brews to remove any lingering plastic taste and smell. If your travel mug doesn’t fit, set the machine on top of a book or box to increase the height between the counter and the dispenser nozzle. Avoid clogged needles by removing the K-Cup immediately after brewing. Run a cleansing brew (without K-Cup) after brewing milk-based K-Cups like hot cocoa. 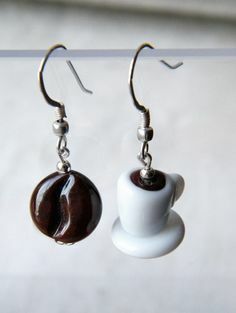 To use old K-Cups, cut the top off a new one and tape it to an old one. Access more cup sizes with a magnet. Be aware that the Energy Saver Auto-Off mode overrides the Auto-Brew timer for carafes. If Auto-On is set for 6 am., and you set Auto-Off so the machine turns off after 15 minutes of disuse, then make sure the machine is set to Auto-Brew a carafe before 6:15. Any later and it won’t work because the machine will have turned itself off. The carafe does not keep coffee warm for very long but an insulated carafe can be purchased separately. The Keurig 2.0 brewers aren’t all that expensive for the features they provide, and thus far seem to be a good value in home-use pressurized single cup coffee makers. The Keurig 2.0 brewers offer a new brewing system and tantalizing options for customizing your brew for the best possible flavor. Users almost unanimously agree that coffee from a 2.0 tastes better than that from the older K-Cup brewers, especially users who prefer rich bold flavor. The larger water reservoirs mean having to refill less often, and the option of brewing a carafe means you won’t have to wait for that second cup. Currently, only a limited variety of Vue packs (for larger cup sizes) and K-Carafe packs are available but we expect that to improve over time. Meanwhile, make sure the flavors you prefer are available in the packs you’ll want to use – including the new version of K-Cups produced after July 2014 (look for the Keurig logo on the lids). If you prefer to brew with ground coffee, the 2.0 machines aren’t for you, since they don’t accept reusable filters for ground coffee. In that case, we suggest you consider one of the original K-Cup brewers found on this page. I recieved a 2.0 from Keurig after a used one I recieved from a friend suddenly wouldn’t work. My friend didn’t know why so out of desperation I called a Keurig, told them I wasn’t the original order but would you please help me. They sent me a brand new K350! Awesome! I love this machine. Unfortunately my employment situation went down hill. So I am greatful for being able to use a refillable filter. However because Keurigs customer service is so awesome,I do use at least 1 of their K cups a day. I usually drink 5-6 cups a day. When my situation improves I’ll drink nothing but Dark Magic on it. Anyway, having always appreciated good coffee but disliking coffee that’s sat in a pot most of the day, I now drink more coffee and practically no soda. The coffee out of my Keurig to me is better than most I’ve had from coffee shops,(most not all) and using K cups is cheaper than coffee shop. I bought the 2.0 k450 back around thanksgiving. It has worked fine up until about a month ago. My husband is at the point he wants to pitch it out and go back he says to brewing coffee on the stove!! We are getting coffee grounds In our cups when brewing and the amount of coffee varies every time we brew. I use 10 oz sometimes I will get a full cup, the next maybe a half of a cup.. Today after cleaning with vinegar the first cup out was just a tricke..I have cleaned it several times with vinegar as per instructions and needles with paper clip. I also use water from my Brita filter water pitcher to put in the coffee water tank, so it is double filtered before use. I don’t get what is going on with my brewer, any suggestions before it hits the street would help. Debi, I’d call Keurig support and see what they recommend (866‑901‑2739). It sounds like you’ve taken the right steps to descale and clean the needles (you cleaned the top needle too, right?). If the machine is defective they will help you get a replacement. Good luck! I purchased the 450 and I already had the 350 and find that the coffee is less hotter than my old one. Does anyone else have this problem? The manual says it gets to 192 degrees but my coffee only reads 170. Pam, are you brewing into a different cup, perhaps one that’s colder than what you used with your earlier brewer? A cool mug will lower the coffee temperature significantly. 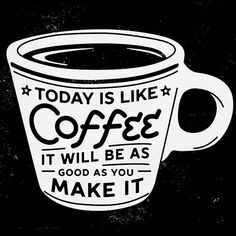 If that’s not the case, and you’re sure the coffee is coming out of the machine at 170, then you should contact Keurig support (866‑901‑2739). Coffee brewed into an insulated cup (like a styrofoam cup) should be about 185 degrees. I can’t get my 2.0 to keep the proper time. every time it shuts off the time usually is faster then the real time. Because of this I can’t use the auto on. Barb, I’m sorry to hear you’re having problems. 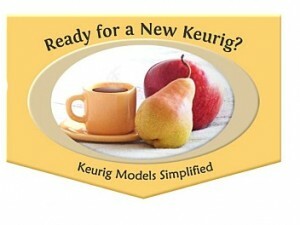 I recommend you contact Keurig support (866‑901‑2739) and see what they suggest. It sounds like you may need to set up your Auto-On a little differently. Or, the clock may be malfunctioning and you’ll need a replacement. Good luck! In October of 2014 I purchased 2 keurig 2.0’s. One for my daughter for her birthday and one for myself. I purchased them both at the same time at Sams Club. I was disappointed that I could only make a 4ounce cup and that my coffee was not very hot however after only 2.5 month of usage the coffee started coming out terribly slow, then it just started spitting out. I de scaled it cleaned the needles all of this several times and it has never worked right. Wouldn’t It figure my daughter called me and said she had the exact same issue recently.. Packed up both and went to take them back to SAMS but they said we have to contact Keurig because its past 30 days. I’m so disappointed and without coffee! Michele, did you contact Keurig support (866‑901‑2739)? Since both machines are doing the same thing I wonder if there’s something else you can do that would fix the problem. They will be able to help you work it out, or offer replacements if the machines are malfunctioning. Melissa, did you contact Keurig support (866‑901‑2739)? I can’t tell from your description if the machines are malfunctioning or if there’s a setting you need to adjust. Keurig will help you figure it out. Good luck! We just received a 2.0 K400 as a replacement for a beloved B60 that died,and we HATE the 2.0 K400. Here’s why: 1) inconsistent sizes running through – we each have 20 oz travel mugs and one day you can select two 10 oz sizes and overflow the mug and the next day you have room to spare; 2) the 2.0 K400 did not come with a carafe, but we were given a 40% coupon to order one. However, in order to use a carafe, you MUST purchase the carafe packs of coffee, you cannot run your single packs into the carafe – once the carafe is locked into the machine, it will only recognize the large carafe pack. This means if we invest in a carafe, we must also “stock” both sizes of packs – NOT. 3) the construction of the machine itself is of VERY POOR quality – the flimsiest of any Keurig machine we have owned, and that includes 3 mini brewers, two B60 elites and 1 platinum. We have been Keurig “believers” until now. While we continue to use the 2.0 K400 that was sent to us as the replacement – because we have no other brewer at our current location, we are actively researching other brands for the long-term replacement. Keurig, in our opinion, has made a very bad decision with its manufacturing and marketing direction – had this been a quality machine, without all the limitations and drawbacks, we would not be looking elsewhere. Thank you for sharing your experience, with us, Donna. People seem to either love their 2.0 machine, and have no problems with it, or hate it. It will be interesting to see what Keurig does from here. The Keurig B60 is still available on Amazon. You might also want to consider the Keurig K155/B155. I hope you’ll let us know what machine you choose. Received Keurig 2.0 as a Christmas Gift….Tried all the flavors of coffee that came with the unit, however, all flavors of coffee was very strong and I could not drink the brew, even with adding more sugar and milk. I prefer my own brand of coffee. Chuck, did you try the largest cup size (the more water, the weaker the coffee)? A light roast will also produce milder coffee. There are now reusable coffee filters for the 2.0 that allow you to use your own coffee. You may need to experiment a bit to find the right amount of coffee and water (cup size) to produce what you want. Good luck! How do I make froth, I love my machine, no problems. The built-in frothing device makes hot chocolate a little fluffy, but it doesn’t make real milk froth. For that you’ll want a handheld milk frother. I actually love the Keuring 2.0. Using the K550. I tried (with my old keurig) my own coffee with the reusable cups and to put it bluntly, yuck. Since I have been using k cups, won’t go back to using the reusable cup. Just can’t get the same taste and I tried many times. I love the breakfast coffee. So, although some don’t like the idea of only using registered k cups, I think it’s great. I can understand why Keurig did it that way. If one rather use any k cup, there are machines out there which do that. I haven’t had any problems with the K550. Great machine. I enjoy a nice cup of coffee. I look for aroma, taste, temperature, darkness of the fluid and stimulation of the senses. My son wanted me to have the new technology in coffee brewers and boy were we disappointed. An old fashioned stove top coffee percolator can produce a better cup of coffee. This whole coffee extravagant production is way to expensive to taste like tea!! !I did select the strong feature on the keypad. What a tremendous disappointment. I encourage wise consumers to conduct a real taste test for yourself. Save your money because the bells, whistles and turquoise light are all just a distraction, instead close your eyes as you take a sip of this coffee, do you really get the urge to smile? Probably not. As you’ve clearly shown us, Monica, Keurig brewers aren’t for everyone! Coffee connoisseurs are likely to be disappointed. Choosing the bold setting, the smallest cup size and K-Cups marked “Extra Bold” will produce the strongest, richest coffee from a 2.0 brewer. If that’s not working for you, then you’ll probably prefer a coffee press, cone pour-over system, or your tried and true percolator. Thank you for sharing your experience! My wife got me a K550 for Christmas; I had to have it replaced because the keypad was unresponsive without a lot of hassle. I got the replacement from Keurig a couple days ago and it works perfectly. I love it and have had no other problems. Glad you got it worked out, Jeff. Happy brewing! Bed Bath & Beyond has a the Eco-Fill 2.0 filter cup that works perfectly with the Keurig 2.0 for ground coffee. It is stainless and cleans easily. Thanks for the great tip, Alan! Did not receive a owners/operators manual in the box with my K460. Sorry to hear that. This online manual for the 2.0 400 series should help. Your review of the 2.0 machine was ok, but I am a heavy Keurig user- this would have been my 5th machine, and it is the worst one made. Besides the encoded k-cups, a work around I could have lived with, I ran into these other issues. The machine delivers an inconsistent cup of coffee concerning flavor. Weak more often than strong. The machine delivers an inconsistent water volume. I want 12 oz. 6 oz. x2 gives me a different level in the cup every day. For the first time I am getting coffee grounds in my cup. It takes longer to get a cup of coffee, and if the cup sized is miscalculated you cannot power the machine off as with the old ones. You had better have a spare cup to catch the overflow. Keurig has contacted me but I am so disappointed in the quality and performance of this unit, it is going back to the store. We will use the older unit for it was at least consistent. Keurig B60 is our current unit. We had and loved the K70 Platinum series for its 12 oz. serving size and 72 oz. reservoir. Unfortunately, that unit suffered a power surge and died. We are searching for a replacement. For me, the k70 was the perfect unit. To me the only thing that could have helped was a larger reservoir on it. Thank you for sharing your experience with your 2.0 machine, Stephen. It sounds like your machine is malfunctioning, as many users report consistent cup sizes and flavor. Keurig’s patents on K-Cups are running out, which is partially why they’re attempting to regulate which K-Cups are used. But with this machine Keurig is also attempting to reduce complaints about weak coffee. That’s why the larger travel mug sizes require Vue packs, which contain more ground coffee – unless, of course, you hack the system and can brew larger cups with K-Cups. The specially coded K-Cups also allow the machines to regulate the amount of water for each specific K-Cup flavor, in order to produce the best cup of coffee from each. I’m not saying that the machines are perfect, but it’s early yet and we probably don’t have a complete picture of how well they function, since people who are having problems are usually the first to speak up. We are monitoring this and will adjust our review as needed as more information comes in. Thanks again for giving us your thoughts to add to the mix. The K70 series machines, specifically the K75, are still available so you may be happier replacing the one you had that liked so much. Or, for a larger reservoir, consider the K155, which is a sturdier model for both home and commercial use. Learn more about each of those models here. Not sure if I should purchase a new keurig or the older model? Looking to purchase one. I have used the older model before and like it. The new one sounds (sorry) like to much trouble with k cups. Are stores and the manufacture willing to sale and make many different brands? Judy, all of the 250+ K-Cup flavors are available in the new K-Cups that work with the 2.0 machines. You just need to find a retailer who is stocking the new ones instead of still selling out their inventory of the old ones. Bed Bath and Beyond is a good place to look. Also, the Freedom Ring (free) allows you to use older and generic K-Cups with the 2.0 machines. I have to disagree with your conclusion that the majority of 2.0 reviews are negative ONLY because of the k-cup limitation. On multiple sites, Amazon, Costco, etc., the majority of negative reviews are because of brewer failures including multiple replacements. It appears the the quality of the 2.0 brewers is much worse than the original. I’ll stick with my nearly 3 year old original Keurig until it dies before I try another. Thank you for sharing your thoughts, Woody. 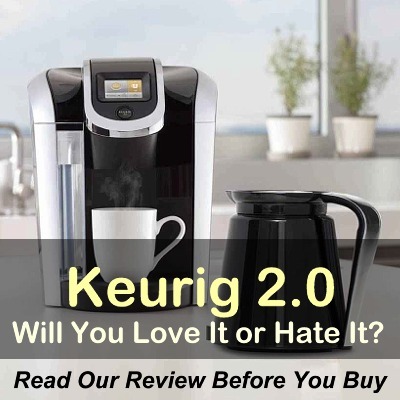 At the time I wrote this review most people were unhappy with the 2.0 machines because of the K-Cup limitations. Now that the machines have been out for awhile we’ll be able to get a better read on how well they perform and how long they last. Keep in mind that Keurigs by nature are a bit tempermental and many complaints are due to user error, not machine failure. 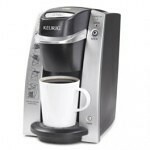 Keurig tends to ship a lot of replacements for many of their home models. It may be too early to tell if the 2.0s are of lesser quality than the originals, but we will be watching this. Thanks for the heads up. My 2.0 k350 leaks water after brewing has been completed….thinking it might be the o ring. Deb, you may be right but I suggest you contact Keurig support (866-901-2739). They’ll be able to help you diagnose and fix the problem. Good luck!